Askamore Community Council and Askamore Community Alert have worked together to set up and run this local initiative to try to cut down break-ins and thefts locally. Over 270 people have signed up their mobile phones, and once a report of suspicious activity locally is verified, each of those 270 people receive a text alerting them to the activity / car etc. 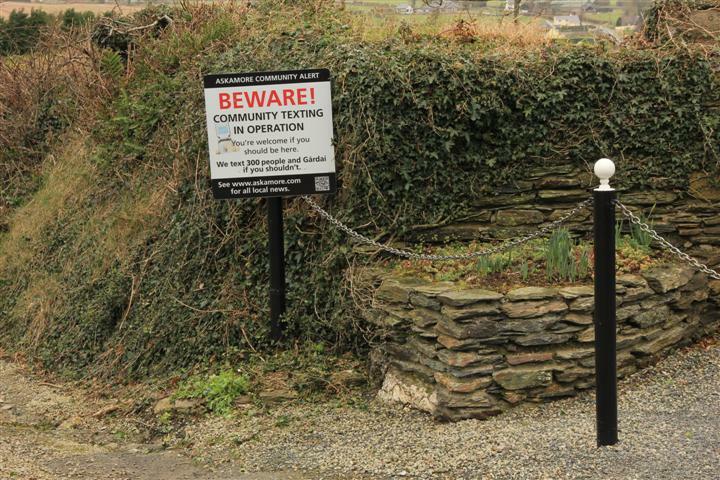 A number of Guards in Bunclody and Gorey stations also receive the texts. This scheme has proved successful in the Rathnure / White Mountain area, and other areas outside Co. Wexford, and robberies have decreased wherever they are in place. 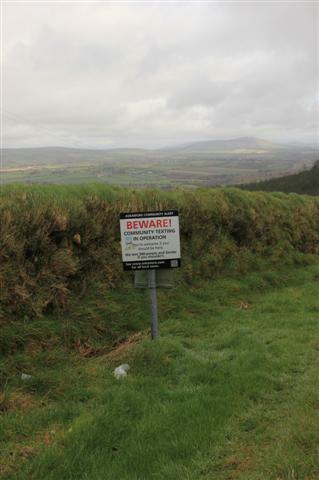 The newly-erected signs, placed at the entrance to the half-parish area, alert everyone, those welcome and those unwelcome, that they are entering an area where people are alert to what’s going on in the area. Anyone who would like to join may do so by contacting Mary Kenny on 0861541948 or Mary Donohoe on 0861633341. The cost to join is €5. The area covered is roughly the half parish of Askamore and the immediate surrounding areas. 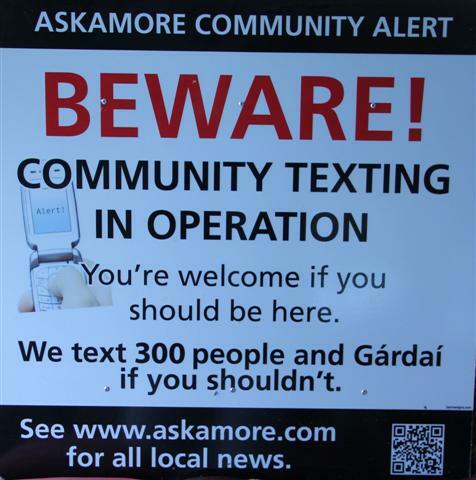 Askamore Community Alert AGM took place in the Activity Centre tonight with an attendance of approx 30 people. Mary Kenny, Ballyconran, outgoing chairperson, welcomed everyone before giving a report on the year’s work. Mary Donohoe, Brideswell, outgoing Secretary, read the previous AGM minutes and gave information on grants available to all over 65s living alone or with others of the same age. She encouraged people to apply once eligible. Stacy Gilbert, Askamore, outgoing treasurer, reported on the relatively healthy state of the organisation’s finances. Mary Kenny then launched the “Bottle in the Fridge” campaign, telling the audience that every household locally will get this bottle from the Community Alert before Christmas, and again she encouraged people to use it. Read details of this project here. The outgoing officers stepped down for the election to take place, but each were re-elected unopposed. 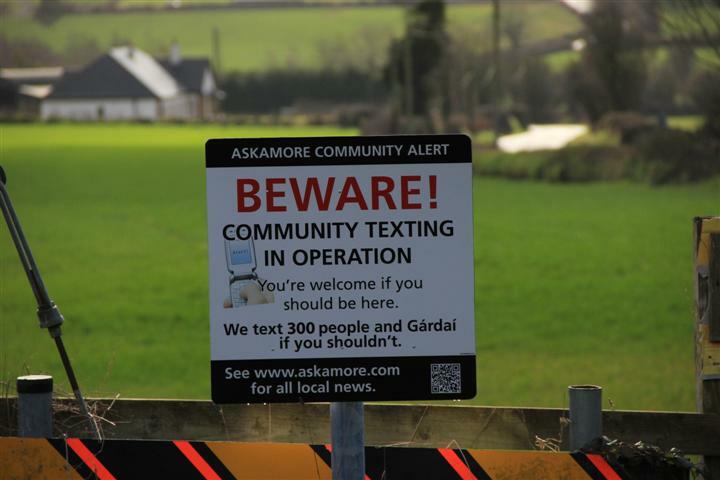 Askamore Muintir na Tíre Community Alert host their AGM next Tuesday night, November 29th at 8pm in the Activity Centre, Askamore. On this night they will also be launching their new campaign – the bottle in the fridge. The ‘Bottle in the Fridge’ is an initiative whereby people store their medical information in a specially marked bottle in their fridge in case of emergency and is particularly targeted at older/vulnerable householders and those with a medical condition who live on their own. 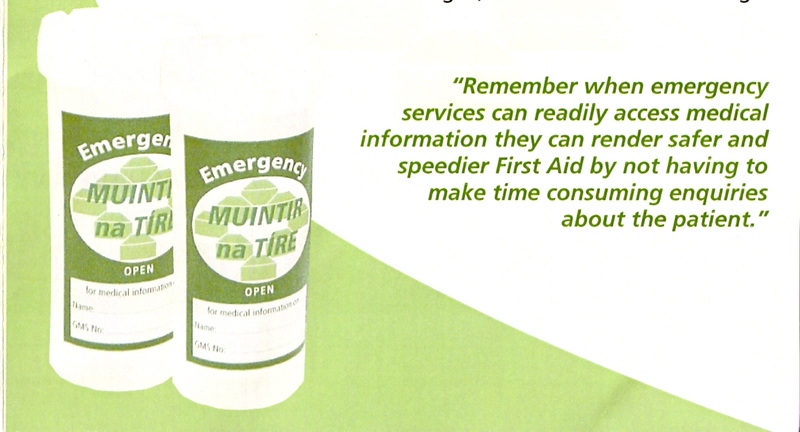 The bottle contains a basic medical information form which the holder has completed, along with green and white Emergency Services Stickers which are unique to the scheme. Forms are completed, sealed in the special bottle and placed in the fridge (as fridges are commonplace in the majority of homes and provide good insulation in the event of a fire.) One of the Emergency Service Stickers is placed inside your front door where it is easily visible and this indicates to the emergency services the presence of emergency medical Information for the home owner. Askamore Community Alert has decided to give one of these bottles to every home in the half parish of Askamore, with the hope that they will be put to use in all homes before Christmas.